We’re less than a month away from the biggest tech show of the year(I can feel my heart rate rise just thinking about it), but it seems Samsung couldn’t wait until early January to announce its new Notebook 9 Pen. Available in 13 and 15-inch versions, Samsung’s 360-degree 2-in-1 is aimed at creative types, and as its name implies, it comes with a stylus that looks and feels quite similar to the one that comes bundled with a Galaxy Note 9. Between this and systems like Lenovo’s Yoga C930 and others, I can get behind the trend of including dedicated pen storage on laptops that come with styluses. On the Notebook 9 Pen, Samsung claims it has reduced the stylus’ latency considerably, but the real upgrade is probably the addition of three replaceable nibs that let you customise the pen tip’s shape and friction to better simulate the feeling of pen on paper. Samsung says that for 2019, one of its goals is to work more closely with component vendors like Intel and Nvidia so that its laptops will come equipped with the most up-to-date specs. 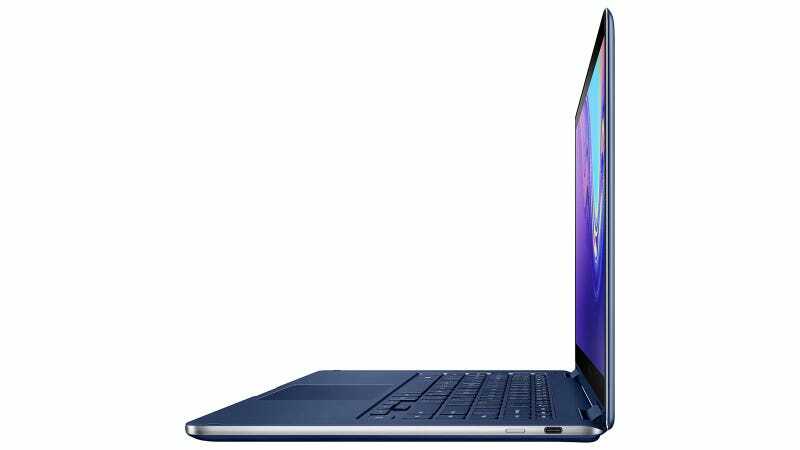 On the Notebook 9 Pen that means you’ll get the choice of a couple 8th-gen Intel CPUs, DDRR RAM, NVMe PCI SSDs, two Thunderbolt 3 ports (along with a third general purpose USB-C port), and even an optional Nvidia MX150 GPU for people who need a little extra graphics power. 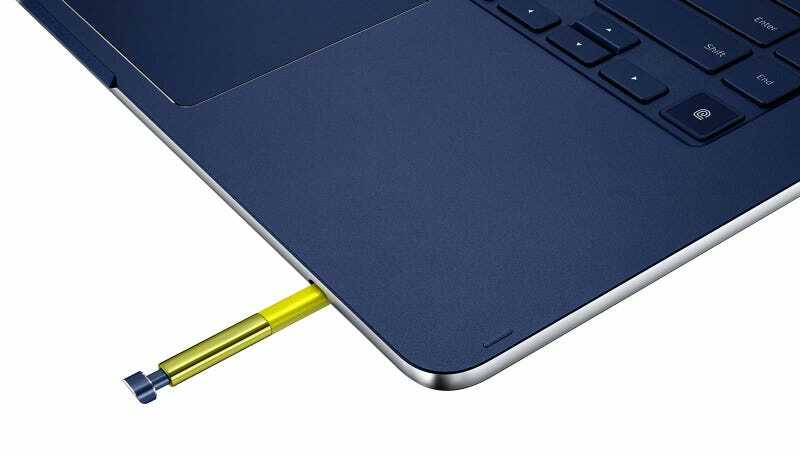 Designwise, the Notebook 9 sports a colour scheme that sort of matches the Galaxy Note 9, featuring an all-metal body covered in shiny blue paint, while its pen gets a contrasting yellow finish. While I did get a brief chance to check out the Notebook 9 in person, it’s hard to draw much of a conclusion about it yet. Its build feels solid, and its specs look competent, but in the end, a lot of the Notebook 9's appeal will come down to how much it costs. Sadly, Samsung hasn’t provided any official pricing or availability info for the Notebook 9 Pen other than that it will go on sale sometime in 2019. 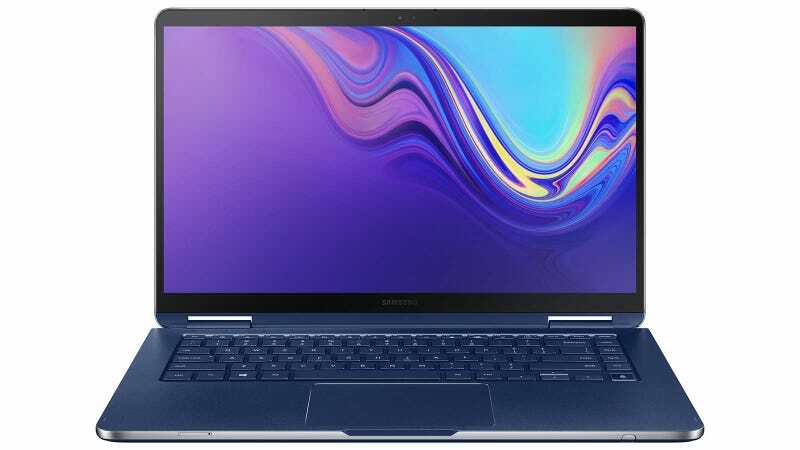 However, Samsung focusing on making sure its laptops have the most recent specs it can get is a good sign, and it’ll be interesting to see if this a trend that continues on any more devices Samsung has planned for CES proper.